For a food processor to earn its keep, it should be a countertop workhorse that chops and slices at lightning speed and turns blocks of cheese into dairy streamers without a single grated knuckle. When you're shoving a potato down the feed tube of a powerful food processor, you can't help but smile at how smooth and fast it does the job. And yet, if there's one piece of kitchen gear that elicits groans from the Serious Eats culinary team when they have to lug it out, it's the food processor. For those with restaurant-grade knife skills, speed alone isn't always a big selling point. When you add up the time it takes to get the 20-pound appliance out, set it up, use it, and then clean it, it can often feel like more trouble than it's worth. That aversion to food processors isn't because the machine itself is inherently bad. The culprit is those hordes of poorly designed ones, and there are many. Setting a bad food processor up only to have it indiscriminately hack at your vegetables, take a large chunk of Parmesan for a spin under the lid, or fling soup onto your walls doesn't exactly elicit a desire to use it regularly. A good food processor is another thing entirely. It's easy to use, and it's quiet, quick, and effective. It pulls doughs together in a matter of seconds with no additional kneading required. It turns nuts into flour, beans into purées, and large chunks of aromatic vegetables into a fine mince with just a momentary blitz of the twirling blade. The trouble, in the end, is price. Because it's such a popular piece of kitchen gear, manufacturers have tried to make a model for just about every budget. You can find some for less than $100, and others for five times as much. Do you really need to spend top dollar? And if not, how low can you go before the savings just aren't worth the piece of crap you end up with? To find the best food processors across a spectrum of price points, we tested 11 models, ranging from 12- to 16-cup capacities. Our winners are the ones that are worth lugging out of the cabinet again and again and again. The Magimix has a few design elements that elevated it to the top of our list, including a chopping blade that nearly touches the side of the bowl for complete and efficient processing, an innovative dough blade shape that kneaded pizza dough better than any other machine we tested, and nesting 12- and six-cup work bowls that offer increased flexibility. It never so much as broke a sweat in any of our tests, all while boasting one of the quieter motors of the lot. The brand name of this machine may not ring a bell for many readers, but it comes from good stock: This is the prosumer line from Robot Coupe, the company that makes the food processors used in just about every restaurant and commercial kitchen. While this classic from Cuisinart is far from the cheapest machine on the market, it's as inexpensive as we're willing to recommend based on our tests. At about half the cost of larger, 16-cup models, it handles the basics with ease, efficiently grating semi-firm and hard cheeses, pulling doughs together—despite not having a specialty blade—and slicing potatoes and tomatoes without destroying them. Rather quiet, it has a simple two-button control for easy pulsing and continuous processing. Just don't expect an array of accessories or a parts caddy. The Breville Sous Chef fell just behind the Magimix in core performance, but it made up for it in capacity and intelligent design. It comes with a battery of well-designed attachments, including an adjustable slicing blade that's capable of producing a wide range of thicknesses. It's also incredibly intuitive to assemble and use, and, despite its size, it was nearly the quietest model we tested. Plus, a built-in timer helps you keep tabs on your work. This Breville Sous Chef is a smaller, slightly less powerful version of the 16-cup model, but it still has enough muscle to bring dough together effortlessly. It, too, has an adjustable slicing disk that made short work of potatoes without excessive waste. When filled with nearly four cups of water, the Breville didn't leak a drop—which is more than we can say for several of the 14-cup machines we tested. Directives telling you which way to turn the work bowl or lid make working with the food processor easier. Many of the food processors available today seem to justify their price tag by offering a parade of attachments designed for ever-more-specific tasks. One model came with a plastic disk that whisks egg whites, while another included a flimsy wire beater that fit inside the work bowl. A few models claimed to go beyond mere slicing and shredding by offering a dicing attachment; those didn't work so well. Such bonus attachments are nice when they work, but ultimately, a food processor needs to be judged by how well it performs its core set of tasks—slicing, chopping, grating, puréeing, and kneading. When a processor is good at those, that's when we can justify dragging it out of storage. A food processor does things that you otherwise might do with a good chef's knife, a box grater, a mortar and pestle, or your hands. That is to say, it slices, grates, minces, kneads, and purees. It doesn't do all of those things as well as the more manual alternatives, but it certainly does them more quickly and easily; and in some cases, such as with kneading and building gluten in a dough, the power of the processor motor can work to your advantage. While a person can certainly make do without a food processor, it adds some serious convenience and speed to many kitchen tasks. If your idea of a good time isn't standing in a kitchen finely mincing pounds of onions, carrots, celery, and garlic by hand for an hour, just to make a soffritto for ragù bolognese, a food processor will more than prove its worth. It's also important to note that, while there's some overlap, a food processor is not the same thing as a blender. They both have motors that power spinning blades, but the shape of the processor bowl versus the blender jar and other variables make each better suited to certain tasks. You can use either to make mayonnaise, but a blender will more efficiently puree liquids to a smooth consistency for, say, a breakfast smoothie. A food processor, on the other hand, will handle thicker and dryer ingredients like chickpeas and raw vegetables with more ease, quickly producing hummus or finely minced vegetables without much trouble. All the food processors we tested have a similar construction: A heavy motor turns a spindle that can be fitted with various blades or disks inside a work bowl and lid. The spindle either sticks up through a hole in the work bowl so that an attachment can be set directly on it, or it engages, blender-style, with a gear built into the work bowl that then powers whatever attachment is connected to it. In our tests, the latter design was less prone to leakage, since there is no hole in the work bowl base. In all cases, the work bowls twist and click onto the base. After that, the lid usually twists to lock onto the work bowl, though some companies are experimenting with different lid-locking mechanisms. In many cases, the bowl and lid assembly are a one-two punch of frustration, especially since there's no consistency from one company to the next on which direction to turn the bowl and lid to lock them. Even after working with the machines for days on end, we often fumbled with many of them before getting them into action-ready position. We awarded points to models that included directional arrows or printed labels that help you align the motor, work bowl, and lid. Once locked in, most lids have their feed tubes nearest the user, which we prefer to builds that place the tube on the far side, an awkward design that forces you to reach across the top to send ingredients down into the machine. In terms of size, we think a 14-cup model strikes the right balance for most homes, because it can handle all but the biggest holiday-meal prep, yet still fits on a pantry shelf or inside a base cabinet. A 12-cup model may be a better choice for small kitchens, though even this requires a fair amount of storage space. Large-capacity, 16-cup models, meanwhile, are bigger than most of us need, but if you regularly feed a crowd, it might be worth sizing up just to avoid having to process ingredients in batches. The models in our tests ranged from 420 to 1,300 watts. The thing is, motor wattage is the RPM of the countertop-appliance world: Consumers are trained to look for it, and marketers never miss an opportunity to cite those impressive-looking figures. But watts are a measure of the power consumed by the motor and not an indicator of how efficiently the motor uses that power, nor the overall quality of the machine's build. You can use wattage to roughly gauge which models have bigger motors, but that won't always lead you to a better food processor. Just to name one key example, the most power-hungry unit we tested failed to make it into the top four, even though another food processor from the same manufacturer did—despite using roughly 550 fewer watts. The more expensive machines, and all of our winners, have induction motors. Unlike a traditional motor design, which needs carbon pads to transfer current and turn the shaft, an induction motor passes current through a stack of steel rings, creating a magnetic field that spins the motor without that physical connection. This means less friction, heat, noise, and mechanical wear. In our tests, induction food processors averaged around 73 decibels when spinning a blade in an empty work bowl, which is equivalent to the volume of a normal conversation happening three feet away from you. Both Brevilles feature a 24-point adjustable slicing disk that works well and can be set to zero, which reduces the chance of accidentally cutting yourself. Some brands offer an adjustable slicing disk that allows you to choose from a wide range of thicknesses, from about 0.5 to 7.5 millimeters. It's a great option when it works, and confers a small safety benefit, as the blade can be lowered until it's flush with the disk's surface, hiding the cutting edge. When it doesn't work, though, it's a disaster. One model that we disqualified had an adjustable slicing disk that couldn't hold its setting when subjected to the processor's spinning force; thin slices would rapidly grow fat as the blade spun out of position. Almost all the brands we tested included a plastic dough blade as a fourth attachment. Not nearly as wide as the S blade, the dough blade is designed, presumably, to reduce drag on the motor as it swings around heavy dough. Some models include a storage tray with labels for all the parts, which can be just about as large as the food processor itself. Without one of those, you're on your own to store the additional parts. Another popular feature on many models is a smaller work bowl and smaller blade that fit inside the primary one. The secondary bowl is typically around five cups in size, though our winning Magimix model includes a 12-cup insert, too. It's nice to have a mini chopper built into a larger processor, but some models leaked when we added even a small amount of wet ingredients to that smaller bowl. Our testing focused on the core capabilities of food processors—namely, how well each chopped, sliced, puréed, grated, and pulled together heavy dough. Nearly as important was how easy it was to assemble, disassemble, and operate each machine. Our testing can't predict long-term durability, but we'll continue to use our winners and will update the review based on further experience. Adjustable slicing blades, when they work, can make paper-thin tomato slivers like this. In theory, the slicing disk should turn produce into a neat stack of uniformly thick cuts. To see how well our field of processors could do this in reality, we pushed both ripe plum tomatoes and firm russet potatoes through each feed tube into the food processor's slicing disk. While most machines had the power to slice well, the better ones created smoother, cleaner slices with less waste. In the case of tomatoes, successful models could slice the fruit without smashing and juicing it in the process. With machines that offered multiple slice-thickness options, we ran tomatoes through a range of widths, from the thinnest up to the thickest. The best could cut an un-mangled slice thin enough to let light pass through. All the food processors we tested cut potatoes, but the best ones did it while generating no more than 2% waste. To test slicing potatoes, we settled on roughly 2.5-millimeter-thick cuts (confirmed with digital calipers), a size most of the disks could accommodate. We calculated not only the quality of the slice but also the amount of waste generated. Most of our winners kept the waste down to about 2%, while sloppier models lost nearly 3.5%. Of all the plastic dough blades we tested, the Magimix's version, with its turned-down flap, was the most effective. While slicing is about a blade's speed and sharpness, pulling a dough together relies on pure brawn. A good food processor should be able to handle both. Most models included a plastic dough blade, except for our winning Cuisinart model, which calls for using the metal chopping blade to mix doughs (though a dough blade is an optional accessory). To see how well they could handle the task, we made two-thirds of a batch of Kenji's New York–Style Pizza Dough in each work bowl. First, we attempted to combine the dry ingredients (flour, sugar, salt, and yeast) with just four pulses. The Magimix was the only machine to complete this with a dough blade, while others required either additional pulses or, in many cases, the intervention of a spatula to stir things around. Interestingly, our winning Cuisinart—the model that didn't have a dough blade and instead called for using the S-style metal blade—successfully incorporated the dry ingredients, too. Next, we added water and let the processor run for 30 seconds. If, after those 30 seconds, the ingredients had formed a nice dough ball, we turned it out of the work bowl and proceeded to kneading. If not, we would allow the machine to continue processing until a good dough ball had formed, noting how much longer it had to run before this stage was reached. After that, we hand-kneaded each batch, recording how much extra time was required to work the dough balls until they were smooth and elastic. The more gluten the food processor was able to develop during its mixing, the less hand-kneading the dough would require afterward. The Magimix was also the only model to work the dough well enough that it didn't need any additional kneading after the processing step—plus, it pulled the dough together in far less than 30 seconds. The Cuisinart—without a dough blade—was the second best at kneading dough, requiring only about 40 seconds of extra handwork. Compare that to one batch that required three and a half minutes of extra hand-kneading. We had questions about the decision to not require a specialized dough blade in this model, but Cuisinart told us the company isn't particularly worried about premature motor failure as a result of using the S-style metal blade for dough, because the bearings around the shaft, often susceptible to failure with hard use, are designed to outlast the motor. While a blender will give you the smoothest purée, a good food processor should still be able to deliver a uniformly smooth consistency across a range of foods, especially thick ones that might refuse to flow in a blender's vortex. We added garlic and lemon juice to the main work bowls (or mini ones, where available) to test puréeing and leaking as we made tahini sauce. Some models never made it past chopping the garlic. The best mini work bowl performance came from the Magimix, after we discovered how to properly assemble the nesting bowls to prevent leaking. The smaller, 12-cup Breville did a better job of combining the garlic and lemon than the splash-prone 2.5-cup work bowl in the larger, 16-cup model. Then we moved the tahini into the large work bowl of each machine, added cooked chickpeas, and timed how long each model needed to bring together a uniformly smooth hummus. The good news is that all the machines passed this test in under a minute; our winners did it at the 30- or 40-second mark. Food processors with S blades that nearly touched the sides of the work bowl aced our chopping, mixing, and puréeing tests. The classic combination of onion, carrot, and celery forms the backbone of many cuisines. In France, when diced, it is known as mirepoix. In Italy, it's often chopped much more finely, at which point it's known as a battuto; when cooked, this becomes a soffritto, which is an essential flavor base in ragù, sauces, and braises. It can be a small pain to properly mince vegetables for a battuto by hand. A food processor can make this relatively painless, but only if it does the job well, creating a consistent mince that isn't crushed and battered to the point of becoming a juicy soup. A food processor should be able to quickly and evenly chop vegetables. While some accomplished this, others roughed up the carrots, onions, and celery until they released water. To test this, we filled each model with the same ratio of large diced carrots, celery, and onions. We then processed each batch while timing it, stopping to evaluate the cut consistency. The work bowls of the 16-cup Breville and 14-cup Magimix were filled with uniform cuts at 15 seconds. Compare that to one budget model that pushed the chopped veggies to the side of the work bowl, where the blade could no longer reach them, forcing us to stop, take the lid off, and scrape the sides with a spatula. Grinding almonds into flour, then passing the results through a sieve, gave us a clear picture of which chopping blades were the most effective. To get a more measurable idea of chopping consistency, we ground 300 grams of whole almonds into flour in each machine, then forced the flour through a fine-mesh strainer, weighing whatever was too large to pass through. Most of our winners did well in this test, leaving behind no more than 25 grams of flour; however, the Cuisinart fell short here, creating nearly twice as many large almond particles as the other top performers. In a similar outcome to the potato test, the better food processors uniformly grated cheese, leaving little waste trapped between the disk and the lid. You might consider mincing a battuto by hand a chance to work on your knife skills, but no one looks at grating cheese as an opportunity to improve their hand-shredding prowess. We wanted a food processor that could produce long, uniform shreds of a semi-firm cheese, preferably from a grater with large holes, and a snowy mountain of hard-cheese shavings from a disk with tightly packed cutters. For this test, we weighed blocks of Gruyère and Parmesan cheese, then pushed each through the appropriate shredder. We weighed any leftover scraps to calculate waste. Some models failed to successfully shred as much as 24% of harder Parmesan cheese, which proved to be the more difficult of the two. A couple of food processors turned the Parm into long, spaghetti-like strands, which aren't really useful for a cheese that's not prized as a melter. Throughout testing, we assembled and disassembled each machine multiple times, swapping out attachments, washing parts, and clicking in bowls, lids, and more. During these steps, we noticed which details made using the machines easier, and which frustrated us. We filled each work bowl with water, then let the machine rip to check for leaks. On top of that, we used a decibel meter to measure how much noise each model made, and filled each with water to its liquid max to check for leaking. While our winners are all capable machines, they're not exactly light or small. Our smallest model, the 12-cup Breville, weighs 16 pounds and is just under 18 inches tall, which is the standard backsplash height below upper cabinets. A food processor is simply not a compact machine. The winning food processors had to handle each of our core tests and be easy to use. All food processors are somewhat cumbersome to break down and wash, but we're less likely to mind that if they do those core jobs well. We eliminated models that failed at key tasks or had obvious design flaws, like one that mangled the sliced-tomato test and then leaked heavily when we filled it with water below its stated max capacity. Another machine's S-style blade and spindle nearly fused when we attempted to chop dates, all before the motor eventually gave up the ghost. What we found, not surprisingly, was a correlation between price and performance, with the pricier machines finishing toward the top. Most of our picks are high-end machines with impressive capabilities. In the end, these terms are relative—no one has yet managed to make a truly inexpensive food processor that's worth buying. As mentioned above, our testing can't predict long-term durability, but we'll continue to use our winners and update our review based on further use. The Magimix's smooth motor powered through each test and brought dough together well enough that it didn't require additional kneading. The Magimix impressed us with smooth performance that never felt underpowered. An induction motor kept the machine quiet as it ran through our tests, including building pizza dough well enough that it didn't require any additional kneading. Imagine: In just 30 seconds, you'll have enough fully developed dough to make four personal pizzas. The chopping blade successfully prepared a uniform and juice-free battuto in about 15 seconds. A wide feed tube made slicing whole produce a snap, though, if you're not careful, the food can be thrown sideways, leading to ugly slices. It was the most efficient model at slicing potatoes, yielding only 1.33% waste. Its tomato slices, meanwhile, were flawless, save for the faintest traces of the blade's serrations. This test proved it's hard to beat a classic: The Cuisinart's budget-friendly price is due in part to a kit that includes only the bare essentials. The biggest knock against the Cuisinart might also be its best feature: It comes with two disks (one for slicing and one for grating), a blade, a manual, and little else. 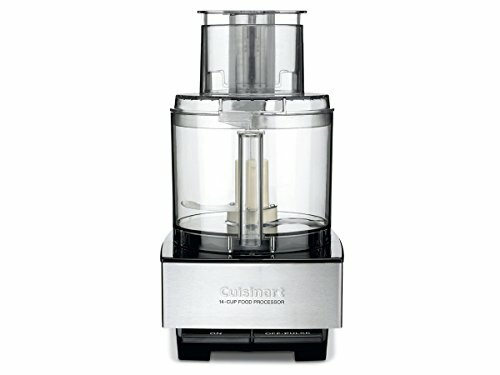 That might make it easy to dismiss, but the Cuisinart does a very good job across the core functions of a food processor, from chopping to shredding. A lot of the other inexpensive food processors out there could take a page or two out of this Cuisinart model's playbook by focusing on getting those primary functions right and ditching the plethora of inevitably crappy attachments. There's a reason this Cuisinart is a classic, and it's reassuring to see that the company hasn't taken its eye off the ball by trying to emulate so many of the misguided competitors that have entered the fray. The Cuisinart's simple and iconic two-button design is intuitive to use. It was also the lowest-priced induction-motor food processor we tested, stumbling only when chopping almonds to a consistent particle size—it finished last among our group of winners on that task. Cuisinart is confident the motor will survive making dough with the metal chopping blade, so we don't see any reason to purchase a separate dough blade. What we didn't like: A few minor issues—like the chute design with a pusher that easily falls out when inverted (unless it's locked in place), and a lid that positions the feed tube away from you, forcing you to reach across the machine—gave us some momentary annoyance. If you intend to make large batches of puréed soups, you might want to consider another machine, as the Cuisinart's liquid max is a relatively shallow 2.75 cups. Fully loaded, the Breville comes with a host of accessories and a built-in timer, but you'll need plenty of storage space for all those parts. This large Breville Sous Chef and its smaller, 12-cup cousin are the most user-friendly food processors we tested. From easy-to-follow arrows indicating which way to turn and lock the bowl and lid, to graduated volumes (in cups, fluid ounces, and liters) on the outside of the work bowl and a max-fill line for both thin and thick liquids, the Breville is easy to assemble, use, and take apart. While this model didn't leak a drop when processing five cups of water, its smaller, nesting work bowl did leak when we pulsed a wet ingredient in it. Otherwise, the Breville finished at or near the top in many of our tests. It excelled, in particular, at chopping consistency—it was the best at grinding whole almonds into powdery flour. The adjustable slicing blade was also a pleasure to use, offering 24 thickness settings, from 0.3 to eight millimeters. (Getting tomato slices on the thinnest setting was difficult, but we were able to cut consistent millimeter-thick slices on setting 2, 4.13-millimeter slices on setting 5, and 6.5-millimeter slices on setting 8.) The disk's safety position, which keeps the sharp edge retracted when in storage, prevents accidental dings and cuts. A built-in timer automatically tracks processing duration, making it dead easy to know just how long you've let the machine run. 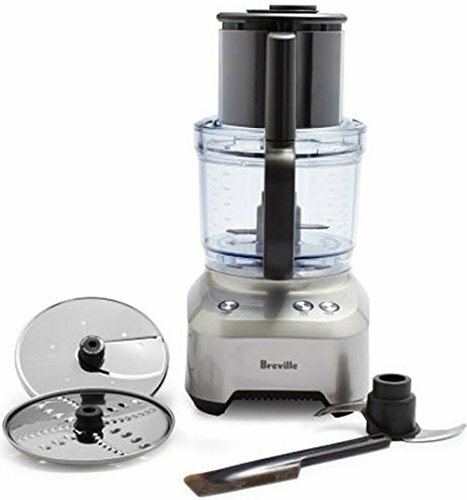 In contrast with the direct drive shaft in most food processors, the Breville uses a ball bearing attachment to connect to the work bowl, like a blender does. This lets you lift the bowl and blade off the motor without worrying about leaks, and there's no threading the spindle back through the bowl when you replace it. What we didn't like: While we appreciate the large range of accessories the Breville comes with, the storage caddy is very big—though, presumably, if you're buying a 16-cup food processor that weighs nearly 30 pounds and is 17.75 inches tall, you have the storage space for the accessories. We were also disappointed to see it struggle with the simple task of blending dry ingredients during the dough test; only with the help of a spatula was it able to whip them together. While the machine is powerful and capable, the accessory storage on the smaller Breville Sous Chef is lacking. The smaller Breville Sous Chef has many of the larger version's characteristics: same user-friendly design, same quality build, same excellent adjustable slicing disk, and same smart bowl-to-motor attachment. While the 12-cupper lacks the built-in timer of its larger cousin and is packaged with fewer disks and accessories, it's a capable cutter that is quiet and smooth-running. It sliced tomatoes across a range of thicknesses without mangling them into soup, and left less than 2% waste on potatoes. One tip: Stick with pulsing when chopping vegetables, since, if left to run, the machine can turn them a bit too watery. What we didn't like: The parts caddy isn't very useful, and, for the price, we'd like to see a smaller, five-cup work bowl, too.